Joy Creek Photo Archive (c) all rights reserved The tulip-shaped flowers of Clematis 'Gravetye Beauty' (F. Skinner) are an exquisite dark lipstick red. 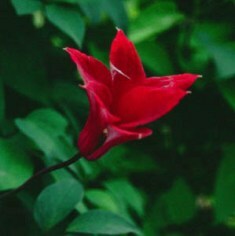 Grow it in a low shrub to get the best view of the flowers. Repeats throughout the summer. All of our Clematis are two year old plants that are suitable for immediate planting in your garden. Midsummer to early fall. 6-8 ft.